Sure, San Francisco's Outer Sunset is on the Pacific-most fringes of city limits, but that doesn't mean it's not worth the trek out to visit. This neighborhood boasts expansive Ocean Beach, parks, and a surfer chill vibe that rivals anything you'll find in Southern California. And because we're still in San Francisco, there's amazing food, shops, and some great bars to boot. Go west. Seriously, keep going...until you hit the ocean. Finally, you've reached the Outer Sunset! Unlike the bulk of urban san Francisco, here's a neighborhood replete with surfers, board shorts, and a distinct laid-back vibe. This is the city's no-frills side, a place that's home to the western reaches of Golden Gate Park, chill hangouts like the Java Beach Cafe, and the end points of numerous MUNI transit lines. This large swath of San Francisco used to be nothing more than endless sand dunes. Then the city dumped a bunch of old horse-drawn carriages out on the beach and the squatters moved in, unofficially deeming their neighborhood “Carville.” It wasn’t until after the devastating earthquake and fire of 1906 that people saw potential in San Francisco's "Outside Lands," building track homes side-by-side and transforming the neighborhood into what it is today. Nothing beats a hot cup of joe on a foggy Sunset morning, and this beachside neighborhood features many choice offerings. Andytown Coffee Roasters is a popular spot with locals, serving up a slightly bitter brew and killer pastries, most notably their sweet and savory cornmeal blueberry muffins. However, when it comes to breakfast heavyweights, Devil's Teeth Baking Company is the undeniable favorite. Fans flock here for their beloved breakfast sandwich, a helping of scrambled eggs, cheddar cheese, and applewood smoked bacon, all held together with a homemade buttermilk biscuit. Yum! For Getting Fancy: Head to Outerlands. Though this stylish earthy and industrial space is absolutely packed on weekends, it's much easier to snag a seat at the bar on weekdays. Then you can order dishes like Washington Manila Clams and Smoked Berkshire Pork Chop with brussel sprouts at whim. For Casual but Delicious: Terra Cotta Warrior offers a refreshing take on Chinese food, one that’s spicier and sourer than your traditional variety. For Late-Night Bites: You may mistake Korean eatery Toyose for a garage by its exterior, though inside it's filled with strewn lights and wood beams. Order anything with kimchi and you won't go wrong, and don't miss the chicken wings. The Outer Sunset is by no means San Francisco's imbibing capital, but there are several good places to get your drink on should you choose. For Beer: If you like Devil’s Teeth Bakery, you’ll like Sunset Reservoir Brewery, since they share the same sourdough starter. The brewery boasts five tap beers that cross the flavor spectrum, as well as high ceilings and plant life, which give the space a cool warehouse vibe. For Margaritas: You can’t go wrong at Celia’s By the Beach, a neighborhood staple since 1960. Margaritas come served frozen in cactus cocktail glasses and a platter of enchiladas will help keep tomorrow's hangover at bay. For Anything: Like the mystical phoenix, the Outer Sunset's Riptide rose from the ashes. After a 2015 fire pretty much destroyed the place, its owners utilized money from a Go Fund Me campaign to rebuild it and recapture its same old-school honky tonk vibe. Snuggle up by the fire and wait around for bingo hour to make some new friends, or test out your vocal cords weekly with Riptide's Tuesday night karaoke. 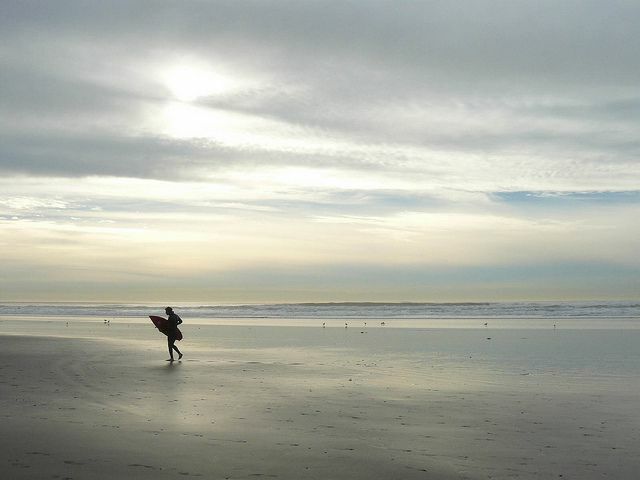 If you’re a fan of the outdoors, the Outer Sunset is your oyster. For the Beach: Ocean Beach stretches for 3.5 miles and serves as a refuge for the Snowy Plover, a tiny shorebird you’ll find skittering across the tideline. You’ll also see a ton of surfers in the swell. You might mistake their wetsuit-clad bodies for seals, although there are some of those in the water too. Bring a blanket and a picnic but keep your eye out for wandering off-leash dogs. For the Park: With winding trails and open fields, Golden Gate Park is the ultimate backyard paradise. There are museums like the de Young, botanical gardens, a disc golf course, and even a herd of buffalo and bison. The park itself is 1,017 acres, which is about 20% larger than New York City's Central Park. For Both: You can spend hours watching hang gliders air-surfing past the cliffs of Fort Funston on windy days, but this stunning portion of the Golden Gate National Recreation Area also has much more to offer, including 200-foot high sandy bluffs, expansive beach, rolling dunes, and ample forested areas to explore. It makes for a fun stroll with either friends, your pup, or both. You may not think there’s good shopping out in this foggy district, but there are unique mom-and-pop shops sprinkled throughout the neighborhood. For Interiors: Across from Devil’s Teeth Bakery, you’ll find Establish, a store filled with plants, vintage clothes, sweet-smelling candles, and all sorts of fixtures to help warm your home. The best part? The shop owner usually has warm cider on hand during winter months and sangria in the summer, perfect for sipping as you browse. For Art: 3 Fish Studios is run by a husband-and-wife duo of artists who specialize in printmaking and painting. Invest in an “I Love California” bear or find your own home state souvenir. For Surfers: Anyone in need of a new surf wax or fins finds their way to Mollusk Surf Shop, a local institution, though they stock so much more than surfing gear. Shop for stylish screen-printed shirts, well-made windbreakers, and swimsuits galore.